“Florence is the city of art for excellence”; where great characters such as Dante, Boccaccio and Machiavelli were born. Florence has also been graced by the works of Michelangelo, Brunelleschi, Botticelli, Donatello and Giotto – whom made one of the art capital cities of the world..” Anyone visiting Florence never remains unsatisfied and this is due to a cultural and artistic heritage, almost unique in Europe and all around the world, which has its bases in the Middle Ages and its greatest splendour in the Renaissance. Florence, along with Rome, made the history of the Italian civilization. In 15th century in Florence were laid the foundations to reflourish art and culture. In fact, thanks to the writers as Dante, Petrarch and Machiavelli, the culture and the Italian language were born. The lily as symbol of Florence was chosen in the second half of 12th century. Indeed Fiorenza could only be represented by a flower. And the most popular flowers in heraldry were the rose and, precisely, the lily. 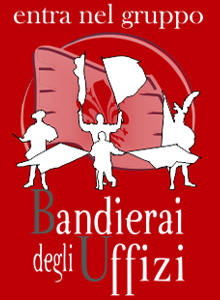 The Florentine lily of “gonfalon” (type of heraldic banner) was originally white on red background; it was changed to red on white background by the Guelphs in 1266, as sign of victory over the Ghibellines. The botanical name of the lily of Florence is Florentine Iris. It is no coincidence that the iris appears in the emblem of the city because it grows abundantly in the fields that surround it. Mythology narrates that the lily was born from a drop of milk fell from the breast of Juno while nursing her little Hercules. The meaning of the lily is, therefore, that of purity and chastity. The abundance and the beauty of the flowers made that the Florentines end up to grow fond of Iris and to associate it to their city life; the iris and not the lily is the emblem of Florence. Its botanical name Florentine Iris also attests that. Red on a white field or white on a red field, according to the dominant political party, it was always the only valid symbol of the city, and in its sign Florence won liberty and honor. Precisely starting from 1100, Florence begins expanding strongly, achieves its municipal autonomy and launches the process of economic and political development which will lead it in the following centuries to become one of the most important cities of the old-country. And, starting from 15th century, it became one of the main reference points of knowledge in the world. These transformations, these new impulses, expressing the concept of rebirth and artistic renewal, which then will give life to the Renaissance; Fiorenza will become the focus of this new cultural movement. At that time date back the first memorable matches of “Football in livery” now commonly called Florentine Football or Historical Football, a game that is rooted in the remote past; according to an ancient tradition “the football game” was born, in fact, along the banks of the Arno river and, only after centuries, it had transmigrated on the river Thames where, changed the name in Foot-Ball, refined the rules, today it has achieved the celebrity, universally recognized. “The Florentine Football” was no more than one of many ways of playing with a spherical body of various sizes, that we know have being used all over the world. From the Greeks, who called the game “Sferomachia”, it passed to the Romans who with the name of “Harpastum” (to rip off) played it on sandy fields applying precise rules to which the two teams of equal number of players had to follow. It had been rooted in the everyday social life habits and it was then certainly introduced also in the “Florentia colony”, where it became, afterwards, the typical game of the city. The competition had masculine and harsh character: brawls, tighten fights and continuous body to body combats for the possession of the ball, tempered the spirit and developed the body of the citizens – especially of the legionaries who regularly practiced it. Football was daily played in Florence by all the young people directly around the streets and the squares, but over time it was characterized by the duality, which saw the performing of “organised” and particularly lavish matches, played by noble citizens who wore sumptuous “liveries” in the most important squares of the city. Football players in Livery (“calcianti”) were “gentlemen” of the age of 18 to 45 years; vigorous and of good names which some of them turned out to become Popes. The Football game was played besides during the Carnival period, also in the most various anniversaries or particular events. Football in Livery continued to perform without interruptions until the 18th century, when the matches in particular the ones “organised”, fell into disuse. The last official competition occurred in January 1739 in Santa Croce Square, after that the secular game completely died, such as a public organised exhibition. In May 1930, fourth centenary of siege of Florence and of death of Francesco Ferrucci, the historical event came back with renewed vigour. Every year, ending at the date of 24 June (S.Giovanni’s festivity), the old 4 neighbourhoods confront each other in Santa Croce Square accompanied along the streets of the city centre by the Parade figurants of the Florentine Republic, starting from the old Dominican convent of Santa Maria Novella, among rings of trumps and rolling of drums that tuning up the March to Field. The multicoloured parade, composed by 530 “figurants”, with the “liveries” of the “calcianti”, the sixteenth-century liveries of the nobles Florentines (chosen among the descendants of the historical families of the city) and of the foot soldiers, with the arms and the flags of that time, dates us back, as if by magic, in the exciting, enchanted, joyous and festive atmosphere of the Renaissance. Everything is still the same: costumes, arms, armours, insignia, music, banners and commands.